Desperately Seeking Adventure: China: Rolling On The River! Chinese people say that a city only truly has wealth if it has a river running through it or alongside it, I suppose London prospered with the River Thames during the days of the British Empire? Looking at three Chinese waterways will be the mission of this blog, from Wuhan's Yangtze to Tianjin's Hai He might reveal a few secrets? China, what's around the river bend? Spanning the majority of Central China has to be the Yangtze River, around its many bends it revealed to me four standalone cities all with unqiue tales to tell with the help of its faithful waterway. In one direction I would find Chongqing to the west and to the far east would be Shanghai, anchoring this vast waterway stood Wuhan. Separating three districts with its mighty flowing nature, a pack of bridges would bring the rivers parting edges together as one. Commissioned by the late Chairamn Mao Zedong the 'First Yangtze River Bridge' allowed train travel between Wuchang and Hankou districts during the city's developing years. From the Yellow Crane Tower I truly grasped the enormity of the Yangtze river, cementing the reason why Wuhan had chosen me to experience my first two years in China. It's clear to see with more bridges and metro lines crossing the big 'Y' its all go for this river! What's Yichang got to do with? The Yangtze River might not flow calmly in certain stages but the scenery changed compared to Wuhan during my Yichang weekend of discovery. The idyllic trees and riverside homes hid a gargantuan project, not choosing the smoothest course the 'Three Gorges Dam' project showed me something quite the opposite. I was educated about the technicalities of the project but just wanted to see the view of the dam walls, it was impressive for sure! Fuelling that big city vibe, Chongqing Municipality blew me away with a vista so strong, the Yangtze River moved with the uneven terrain and the mega-structures that surrounded the booming skyline. The Yangtze might be quiet in certain places but overall it works hard to help transport trade and people along its wide riverfront, rolling into a new century of development its the Yangtze's time to truly show China what its got! The Yangtze River isn't part of my life anymore it's safe in my heart. So it goes, river deep, Yangtze strong! When the cold bites its common to see one or two rivers frozen still, creating a whole new space for all to enjoy. The far northeastern Chinese city of Harbin acquainted me with frozen waters of the Songhua River. That Heilongjiang Province waterway has many functions when the already freezing temperatures turn sub-zero, ice is taken from this river for the world famous Harbin Ice Festival. The sculptures on display at the ice festival were out of this world, even though the below freezing temperatures did their best to disable me I was amazed by that by-product of the Songhua River. A former Russian outpost, Harbin's Songhua River seamlessly flows into Russian territory via the Nen River that flows further north towards Qiqhar, China. Navigating its frozen waters along the China-North Korean border and the Changbai Mountains I have been seriously schooled for sure! For a frozen river it gets about quite a lot H?! Harbin's Songhua riverfront became a multi-faceted cultural experience during that 2017 Chinese Spring Festival holiday, from the unspeakably freezing temperatures I managed to see the Flood Control Monument and Stalin Park. Stalin Park posed as a contrast, from one side the orderly park gardens gave quite the Soviet impression but from the waters side of the Songhua it was a hive of activity. All sorts of fun wintry sports were being played on top of the frozen waters, I wasn't going to indulge in any of those because it was unspeakably cold and that's just not my niche. I saw a few German Shephard dogs pull small sleighs on the ice, it didn't settle well with me but that's China and that was the end of that! Aside from the horribly cold weather I loved the vista of the busy icy river, the ice must have been thick enough because I saw two 4x4's driving normally! With a boosted knowledge of this far northeastern Chinese river I still wouldn't revisit this place because -25 degrees isn't fun! Ringing in 2018, I chose one of China's five Muncipalities for the New Year weekend. Tianjin city showed me a thing or two about its colonial past but it's river impressed me much! Even though the Five Great Avenues gave me a slice of home I was finally drawn to Tianjin's Hai He, that grand river served me its split personality with skyscrapers in one direction and colonial splendour in the other. Chinese people have a complex that water brings development, it was a testament to see Tianjin's Ocean River could have brought the European owners of the Five Great Avenues and the riverside residences? Whatever the claim I was being given all sorts of contradictions, the modernity and classical tones gave me an eye full for sure! I must admit the river looked perfectly faux close to Jinwan Square, those imitation buildings didn't do much for me! Tianjin's Ocean River had its own flex, it didn't need that fakery frankly. Having the name 'Hai He' officially translates to 'Ocean River', from the towering structures of the city centre this river flows into the big ocean blue at the Binhai Port, boosting Tianjin's reputation as an international port with its cargo and passenger offerings its a game changer for China's eastern coast. Beijing doesn't have a coast so most cruise ships dock at Tianjin outside of Shanghai, the opening of the Hai He holds the key to China's newest and most advanced shipping and cargo facility that has been something of a growing passenger cruise terminal. Moving closer to the city centre, I had my eyes peeled for Tianjin's very own! 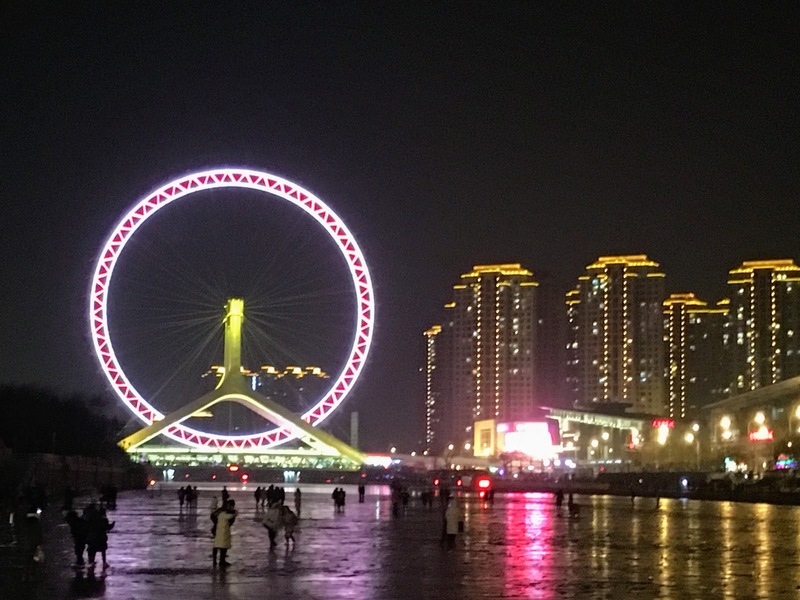 The Tianjin Eye stands as a focal point along the Hai He, it shined a pinky red glow, giving a vibrancy to the Ocean River that other eye's just don't have! China has shown me for certain that river matter, rolling on three of the Middle Kingdom's own worked! 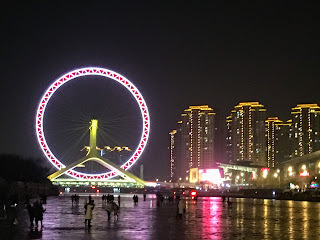 Wuhan's Yangtze amazed me, Harbin's Songhua River froze me and Tianjin's Hai He schooled me! Flow!